Every now and then, Film City seems to have done business with someone who wanted to record his or her own material. 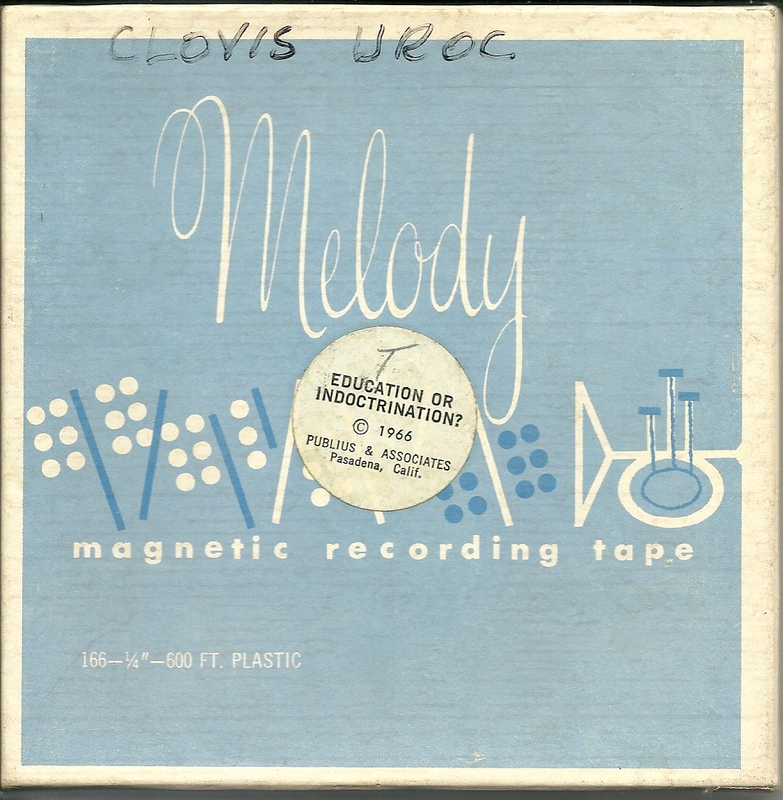 More often than not, this seems to have involved utilizing the abilities of that same Chamberlin, which was, quite likely, played on those records by Rodd Keith. They typically feature the same wording as the song-poems that Film City produced, with such backing bands as "The Film City Orchestra" or, as in today's case, "The Swinging Strings". All such fictional bands actually being one man playing one unusual instrument. 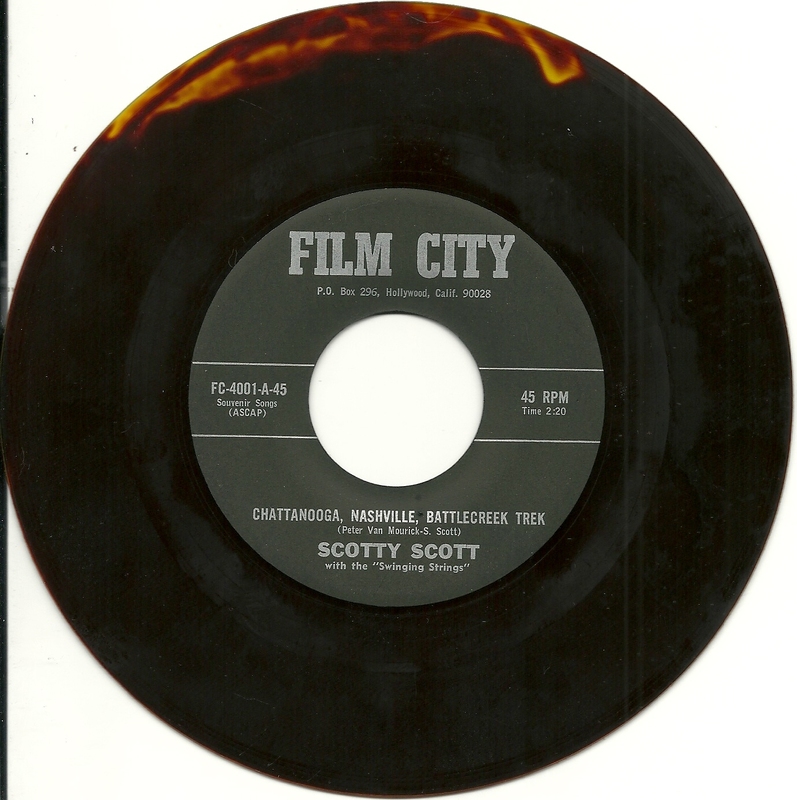 I've previously posted two Film City vanity 45's, one created by a man who clearly didn't know how very little he knew about songwriting, and one by a woman who seems to have known that she was making something fairly goofy. It also seems likely, as a friend of mine has pointed out, that the fabulous record I posted many years ago - "Can I Pawn My Teeth to You" / "Man Do I Like Fridays", by Roy Esser, has the sound and feel of Rodd Keith's Film City productions. Although it did not appear on Film City (Stanton created all sorts of tiny labels as offshoots of Film City), I'm betting that one came out of the Stanton/Keith file, too. Today, another Film City record from the vanity file, and again it's someone who was from the amateur end of things. 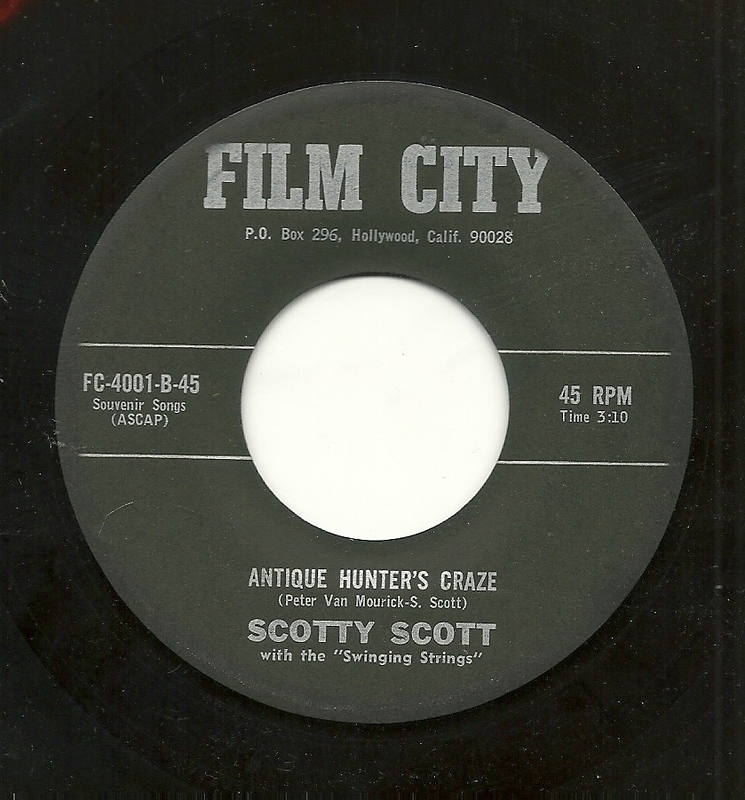 His name was Scotty Scott, and captured on the two sides of this 45 are a multitude of stultifying couplets. Having written my share of lyrics over the years, I know the feeling of needing to come up with something that rhymes, scans well, makes sense and sounds good. 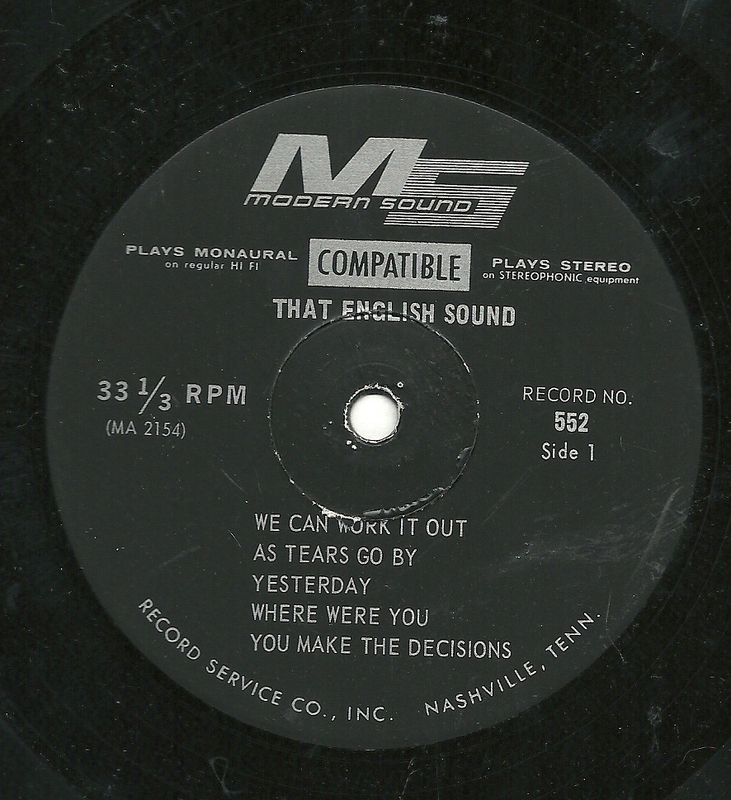 With the lyricist of this record, it often sounds like he settled for "well, it rhymes", including phrases which seem pulled out of thin air, random and non-sequitorial. 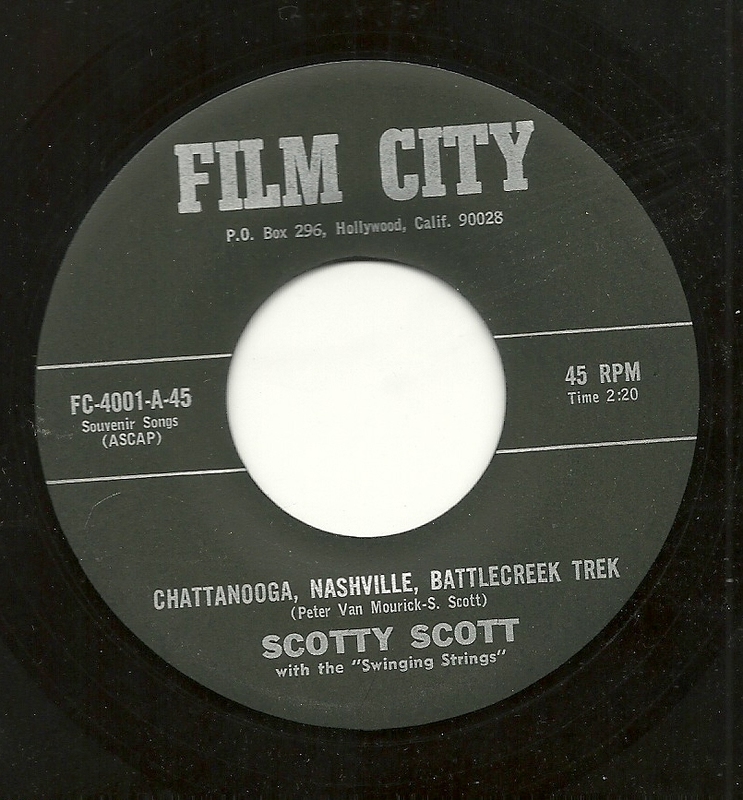 An example: The A-side is titled "Chattanooga, Nashville, Battlecreek Trek", and if you can manage to figure out the point of this song, please let me know. He rambles on about people getting jobs and where they've been and where they are for 2 1/2 minutes, along the way offering up this magnificent rhyme. Then his Uncle Bob, with or without a shoe." Their eyes light up with a smile that before wasn't there. I particularly like that one because it just doesn't scan with the melody at all. Mr. Wheatley Whale --- he's forty yards long, he weighs 80,000 pounds, he's good-hearted, but he's always getting mixed up. Then there's Brumas --- the fattest, funniest little bear you ever saw. Judy, That's Me! --- a little girl who helps Mr. whale out when he gets in trouble. Silly Pilly --- who's so silly! He does all the silly things you DON'T do, because you know better. Then there are all sorts of puzzles and games and jokes and things we like to do and say and think about. Will you write to me and tell me what you like best about our first book and tell me what you'd like in the next book? Best wishes to you from your friend, Frank Luther." Thus reads the introductory page from the one and only issue of Frank Luther's Silly Pilly Comics, and if that doesn't whet your appetite for a look at more, well...um...y'know, I can't really blame you! Francis Luther Crow, aka Frank Luther, nearly forgotten now, was one of the kings of the 78 rpm-records-for-kids market for many years in the 1930s, 40s, and 50s. Besides being an ordained minister, country music artist, radio and television personality (he was even covered by Negativland! ), he also had his own one-shot comic book as well, which brings us to that half of today's post. We'll examine the entire issue of Silly Pilly (what a name! ), as well as a crazy little story from Mighty Bear #14, so hang on to your hats and dive with us into the wackiness that is today's WFMU Comic Supplement -- right after the jump! Here's one of the myriad albums which came out in the wake of the British Invasion, purporting to contain hits by your latest favorite groups, particularly the Beatles. While I found a few sites which shared this marvelous album cover, and several sites trying to sell the album (which I picked up for a quarter), it doesn't look like the material itself has been shared anywhere, with one exception (I'll get to that in a few paragraphs). While most of the other albums that I've seen or owned which tried to glom onto the Beatles magic are from 1964, this one would appear to date from some point after December of 1965, given the presence of both sides of the Beatles 45 release in that month. This is, as you might expect, as half-assed as they come. At no point do the performers sound anything like the original artists, OR like they are from anywhere in England. We are treated to one song each by the Rolling Stones and by Herman's Hermits (the latter featuring a truly atrocious attempt at Peter Noone's accent, and no attempt to recreate his vocal tone), and four Beatle songs from 1965. Amazingly, they manage to mangle key lyrical phrases in both "Help!" and "Day Tripper". Three of the remaining four songs are mysteries, perhaps included to try and fill out what ended up only being a 25 minute album. On "Where Were You", the performers seem to have made the questionable decision to try to emulate the group I'd pick as the worst major group of the era, Jay and the Americans - not only an awful group, but also certainly not English. "You Make the Decisions" seems to want to be a Peter and Gordon song, while "Just Give Me Time" is clearly a Beach Boys pastiche - again, not noted for being British. That leaves the final track, and the real mystery of this album. Because "Bless You Little Girl" turns out to have actually been released - and this performance of it, too - not once, but twice, under two different artist names. The song was co-written by well known songwriter Bobby Russell, and came out under the name Bobby and Buddy and also by Peter and the Rabits (sic). I've listened to all three releases, and believe they are all the same track. How did that song end up on this album? And did any of these labels make their money back. There was clearly talent involved in these releases - bands, string sections, etc. Were enough people fooled to help earn the costs of such a product back? Oh, and COMMENTS ARE BACK!!! Have Your Say!! !